In Japan, the word “sake” refers to all alcoholic drinks. However, in the United States sake is predominantly known as a Japanese fermented rice beverage that can be served hot or cold. 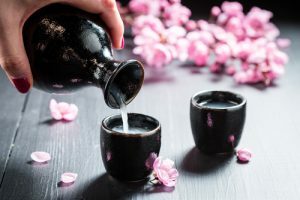 If you’re looking to expand your horizons (and palate) to the Land of the Rising Sun, familiarize yourself with Japan’s most popular exported drink with our beginner’s guide to sake. Often referred to as “rice wine,” the drink’s brewing process is more akin to beer making than wine. With ingredients that include rice, water, yeast, and the “koji” mold spore, the drink’s fermentation process takes around two and a half weeks to a month depending on the desired strength of alcohol content. Aromatics or distilled alcohol can then be added to create a variety of sake flavors with differing aromas and textures. Finally, after maturing in barrels for six months to a year, the sake is ready to enjoy. Junmai – An unadulterated, pure rice sake that only includes the basic rice, water, koji, and yeast ingredients without any additives. Rich and full-bodied with strong bite, junmai is best served warm or at room temperature. Honjozo – This nice starter sake includes a small amount of distilled alcohol to bring out its smooth flavor and aroma. Light and easy-to-drink, honjozo can be enjoyed warm or chilled. Ginjo & Junmai Ginjo – This light, fruity, premium sake offers complex flavors and intense aromas. Easy to drink and often served chilled, ginjo is also available as junmai — without additives. Dai Ginjo & Junmai Dai Ginjo – On the expensive end of the sake-spectrum, the super-premium dai ginjo is a top shelf sake. Very light with complex aromas that enhance its fruity taste, dai ginjo is usually served chilled and also offered junmai. Futsushu – The opposite of dai ginjo, futsushu is regarded as flavorless, low-quality, bottom shelf sake. Nigori – Cloudy and unfiltered, nigori is a sweet and creamy sake with a thick, chunky texture, strong rice flavor, and often served cold. Nama-zake – A rare unpasteurized sake, the sweet and fruity nama-zake must be served cold to remain fresh. Shiboritate – With a wild and fruity flavor, the taste of fresh-pressed shiboritate sake is often compared to white wine. Get a taste of the best sake in town. View the diverse list of sake /Japanese wine selections served at Shōgun Japanese Steakhouse located in the Rosen Inn on International Drive. Call us today at 407-352-1607 or reserve your table online.